Educational provision for schools . . .
Information for schools . . . Here you can find out information about our educational provision, our staff training (Continued Professional Development) and how JGDATA can work within your school to aid pupil personal development, encourage creativity, build greater confidence, improve concentration, assist in social skills and help with working and learning together. SCHOOL Stars . . .
SCHOOL Stars sessions are for children in Primary School and are taught in separate or mixed Key Stages of education (KS1 5-7 years old and KS2 8-11 years old) and run either during the school day or for 1 hour after school for 10 weeks. Each session is designed and created by John Giller with child development at its core, using drama, singing and movement to build greater confidence, improve concentration, and assist social skills and personal development, while allowing students to be creative. Not only a fantastic learning experience, it’s also a great way for children to consolidate friendships in school and have fun. 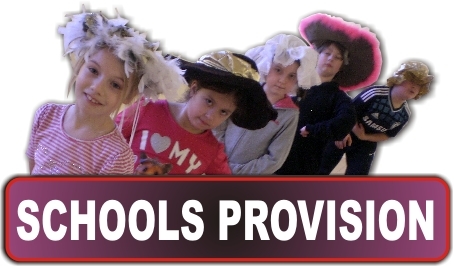 Using a fun filled collection of high energy games, catchy songs and rhymes, together with theatrical techniques such as mime, movement, improvisation, speech and costume, SCHOOL Stars is designed to bring out every students true potential. Come join the fun and become a successful SCHOOL Star. Holiday Clubs . . .
We provide outstanding holiday clubs for schools locally. Each club runs for three hours and is packed full of fun for all ages and abilities. Acting, Singing, Mime and Speech are all used to build confidence, aid personal development, encourage creativity, improve concentration, assist social skills, make new friends and above all it’s great FUN. Sessions run for either a whole morning or whole afternoon - or you can book the whole day! Each holiday club is themed (Easter and Summer clubs) so children can attend both clubs and learn something new each time. We present and embody the diversity of all students taking part through a range of genres, art forms, cultures and approaches to acting, singing and theatre studies. We value everyone attending the academy as an individual, and work hard to promote the personal, social and creative voice of our students, together with the educational development of our younger members. The power to challenge, influence, enlighten and change our lives and those around us is important and our students will be given opportunities to take risks in a safe and supportive environment through high quality, challenging, fun, and meaningful drama sessions. We believe that performing arts is a universal expression of human kind and involvement within it benefits all of our students, especially our young members who are given the opportunity to find their place and voice in society.